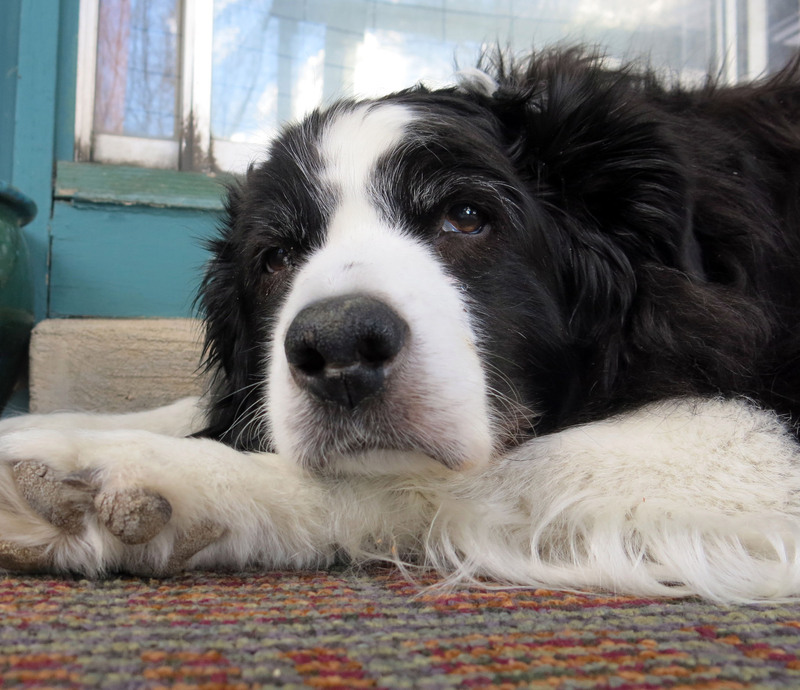 Greetings and salutations, everyone; yes, once again it is I, Chess the purebred border collie, filling in for the guy I live with, and here to bring you some moderately interesting news from our garden. You may remember me from such moderately interesting posts as “Something From Nothing” and “Nothing Much To Do”, among so many, many others. and went all crazy on me. Then he saw these, and went even crazier. He noticed these crocuses because he was out ogling the snowdrops. He claims that few other flowers are as joyful. I guess. I spend most of my time napping, which is excellent. There’s really not much going on here other than that. 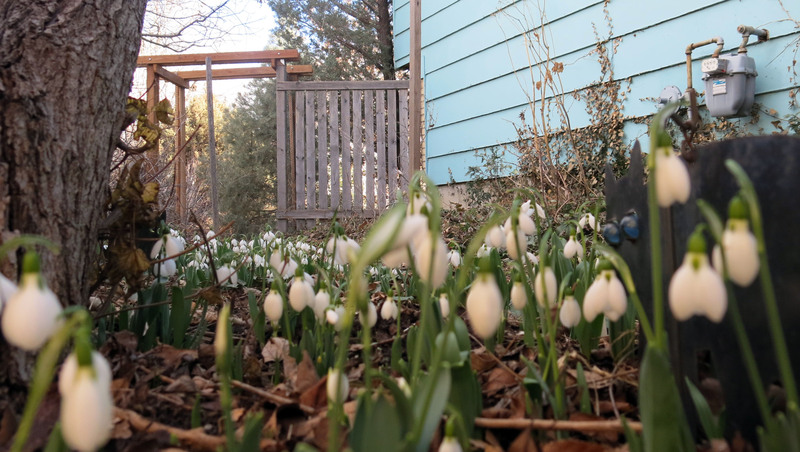 Oh, well, there are more snowdrops than just the one I showed above. Snowdrops. Well, as you can tell. There’s a lot of talk about making room for more, but that’s usually a cue for me to start another nap. 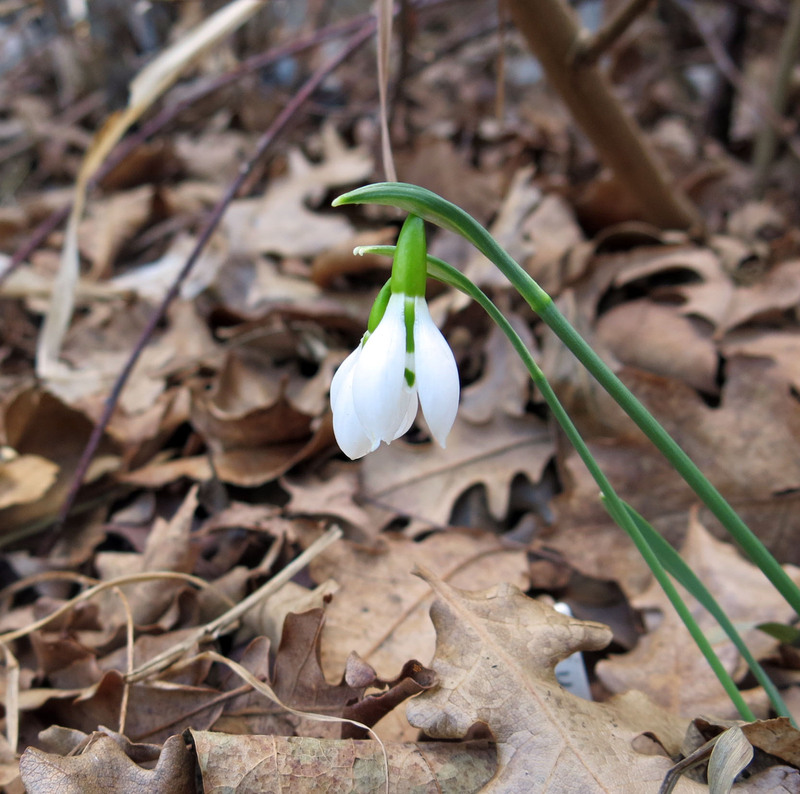 This entry was posted in Uncategorized and tagged snowdrops. Bookmark the permalink. 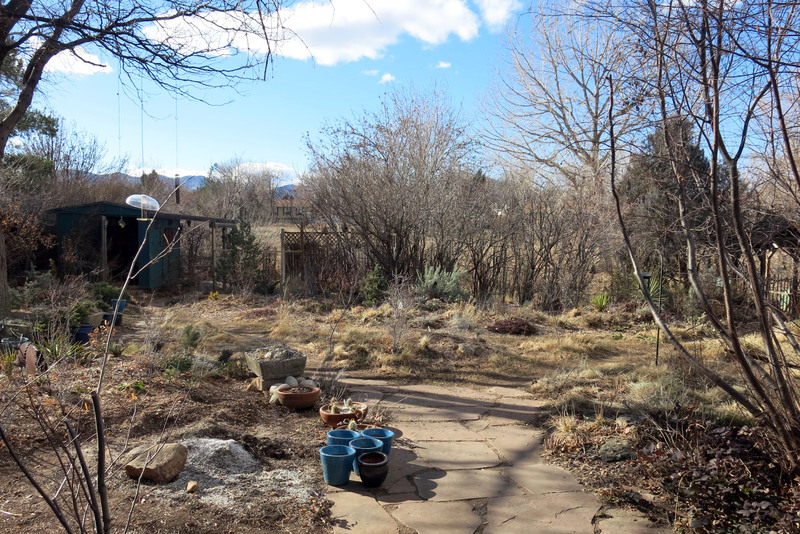 Your yard, Chess, may say winter, but the delicate blue sky says spring. 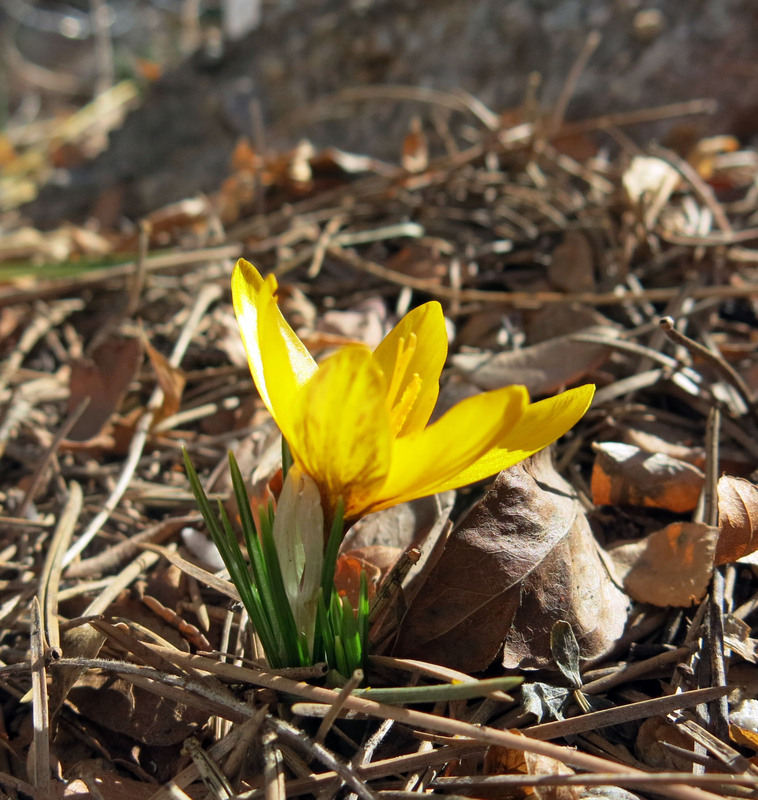 Lemon Tiger crocus is the very definition of lemon yellow and worth getting excited about. My crocus, not so much. 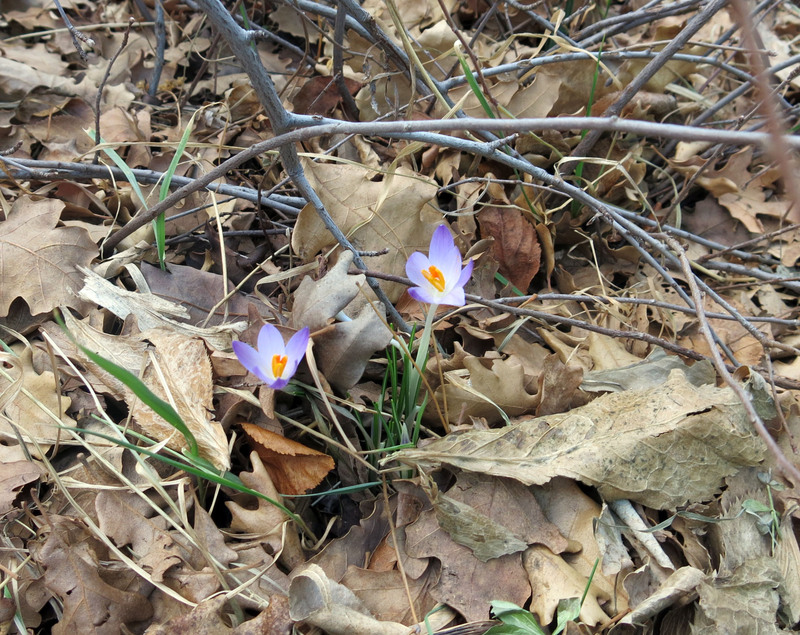 I read somewhere crocus does not bloom the first year in the ground, and if that be true mine are running true to form. Or maybe what I remember as crocus is really a robust chive patch. Talk of making more ground for snowdrops should be followed through. Look at what the guy you live with already has going, he’s obviously got a touch. The world can always use more magnificence. Your starting-another-nap look, Chess, is utterly gladdening. I am captivated by your natural charm. Thank the guy for getting down flat on the floor today to give us your portrait. Thanks; I am rather naturally charming… The guy I live with was looking at CITES permits—just out of curiosity–and wondering why so many spaces have to be filled out for what are, after all, garden plants and not things stolen from the wild. very peculiar. Those snowdrops are as lovely as anything I’ve seen, except maybe you Chess. In a different way. Thanks; I am partly white, but could never be mistaken for a snowdrop. For pictures of spectacular displays, go here http://www.judyssnowdrops.co.uk/index.html and look at “snowdrop scenes”. I hear a heavy sigh when he goes to this site. I don’t know how the British can get anything done, living in a place like that. I know everything isn’t quite so beautiful as those pictures, but how can they do anything but walk around staring and grinning? How does anything get done? Thanks for the link. I kind of like those little white flowers. They’re nice. This guy here is gritting his teeth to see Lapwing and Sutton Courtney growing so well. He tried to order them two or three years ago but they were sold out. Now he knows where they went…. So Dreamboat, a typical winter (if there is such a thing) doesn’t have snow, is that correct. It’s good to see flowers showing their heads now and the profuse snowdrops are beguiling as you are. I do love them. I realised the other day that it will be your birthday soon, won’t it, or are we confused down here. I will be seven in another month Chess and still acting like a two year old, c’est la vie. A typical winter here has snow off and on. One winter we counted over one hundred separate snowfalls, but that was October through April or May. It’s supposed to snow tonight. Weird, gross winters have snow all winter long. But very cold temperatures, which come from the Arctic, almost always are accompanied by snow, so the plants are insulated. 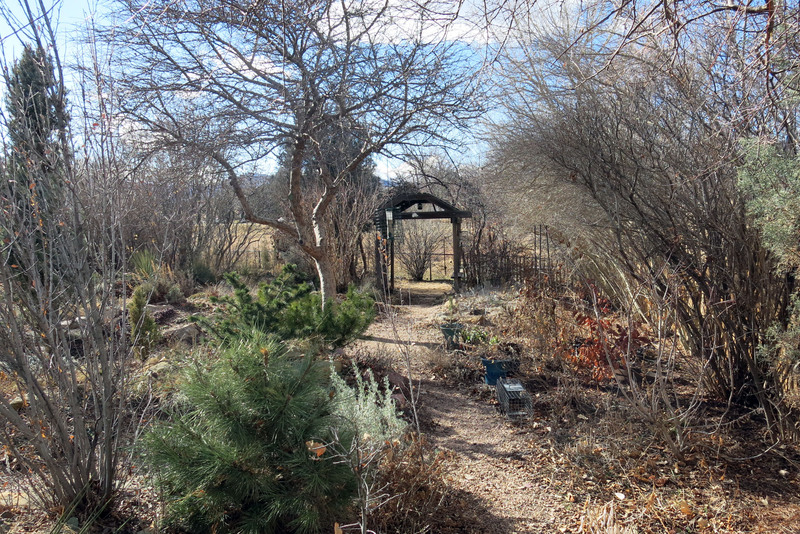 (The cold blast we had in November caused some damage, because some plants didn’t have time to acclimate.) It is indeed true that it will be my birthday soon. Next month. Thanks; I think most of them have been excellent, but this one shows me in a kind of reverie, thinking about stuff. Chess, I hope you can answer a question for me. 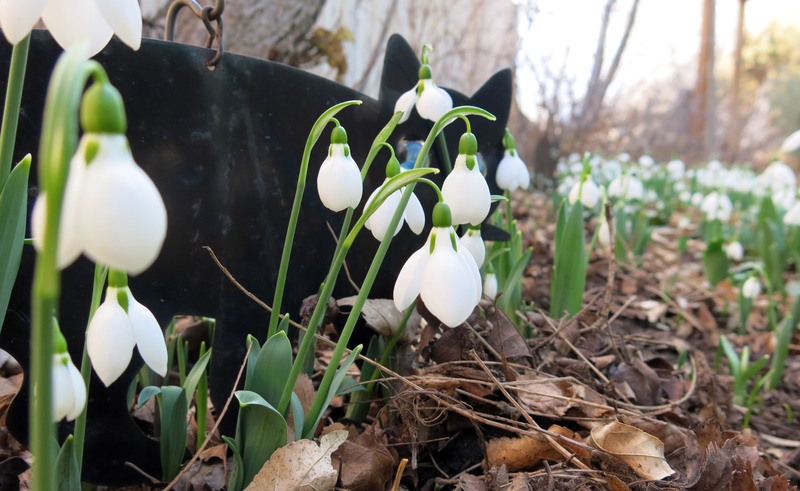 What do snowdrops smell like to you? That’s a good question. There’s only one clump I can smell, because most of them are on the other side of the gate, but sort of like honey, but not really. Honey-like. Hi. It is pretty cool, though there are many more to come, we hope. Snow melting this morning. What a dreamboat! And the crocuses and snowdrops are pretty dreamy too. 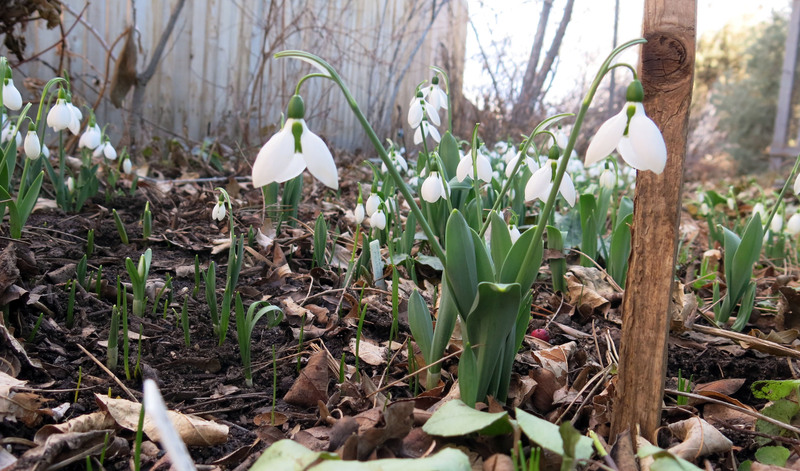 If I remember correctly, Beverly Nichols invented a way to exhibit snowdrops in a vase so as to best display their beauty, which he said was hidden from human-height viewing by the flower’s morphology. 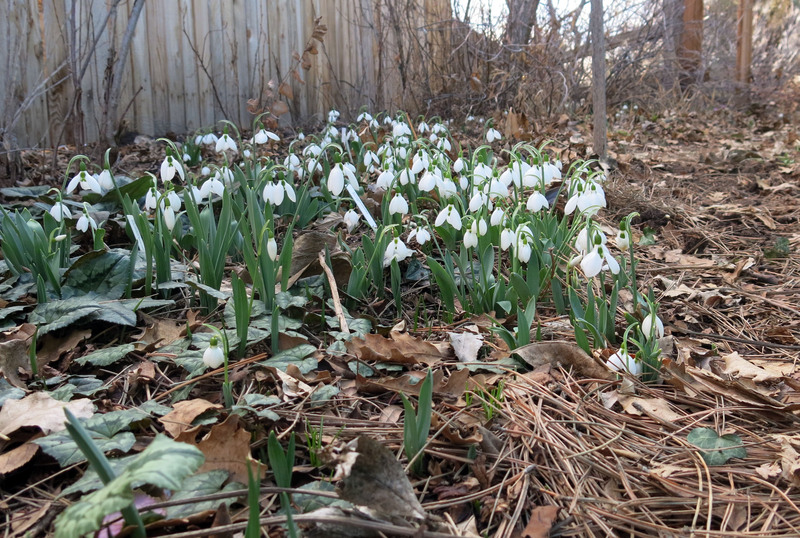 You guy has it right: snowdrops are meant to be appreciated from the ground up. I hope your nose feels nosey today. Maybe someone smooched it all better? Thanks, my nose might be better today. I don’t know anything about cut flowers. My mommy liked to do that, though the guy I live with frowned on it, but he liked her so much he let her do pretty much whatever she wanted. 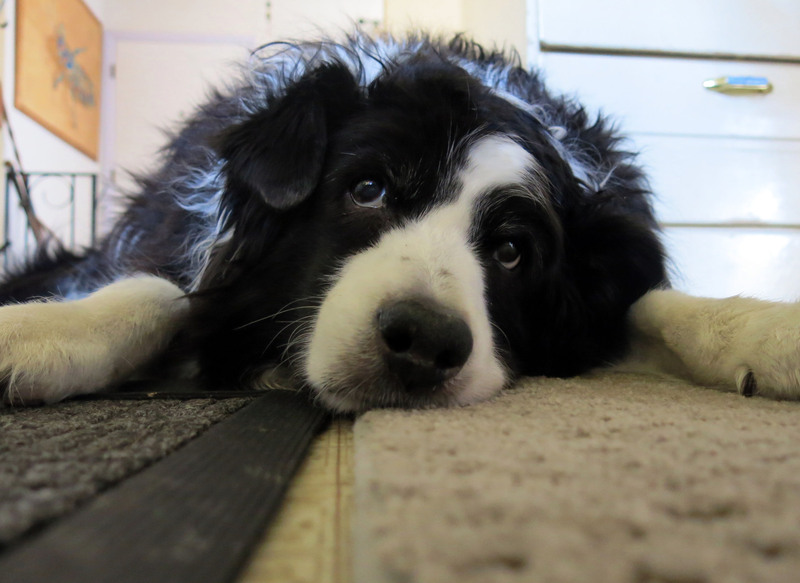 A Border Collie! Oh how beautiful 🙂 Best kind of dog in the WHOLE WORLD! I used to have one when I was younger, and most certainly will get one once I have a big enough place of my own! Thanks; without seeming immodest, I think I would have to agree. I would point out that when the guy I live with started this blog, all gloomy and serious and stuff, it wasn’t nearly as good as it is now. So that says a lot. Yes, we do. It’s supposed to snow here next week, so we’ll have both, I guess. 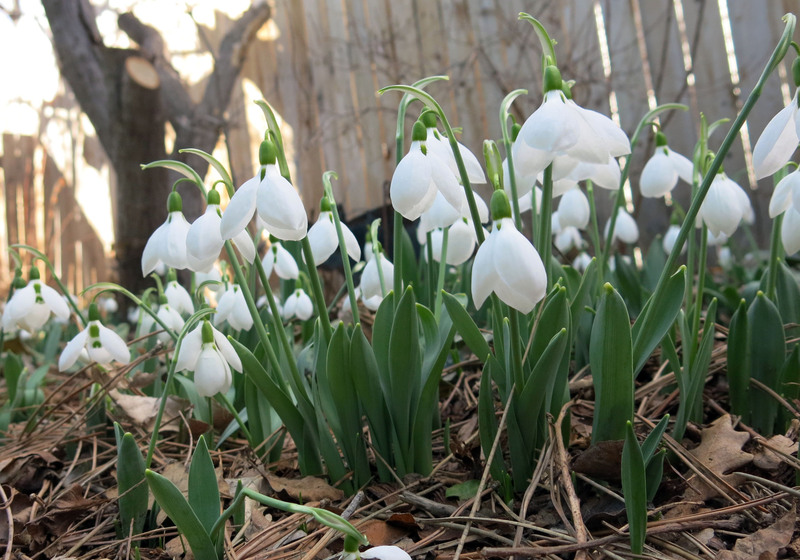 Wow, I have such snowdrop envy. Mine are just dwindly. 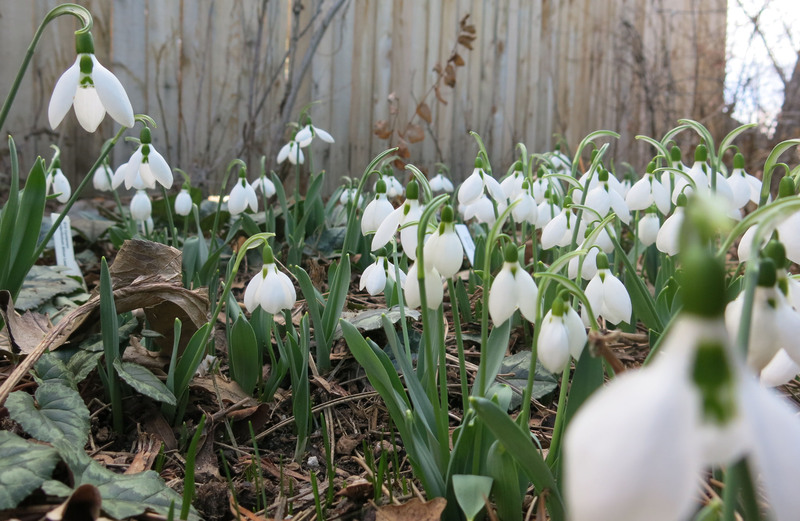 I don’t have any fancy ones, just wish plain old Galanthus elwesii would make clumps like that instead of being all onesy even after four years. There aren’t too many fancy ones here, though if the guy I live with had more money (donations accepted), there would be lots of fancy ones. One thing that’s supposed to help is to feed the ‘drops with a tomato-type fertilizer about the time they set seed. Or an onion fertilizer. Never knew there was such a thing, until someone wrote about it, but there is.